Boardwalk Empire Season 4 review: Bloodier than ever. The new season of Boardwalk Empire. In one of the early episodes of Boardwalk Empire’s new season, which begins on HBO this Sunday, a young J. Edgar Hoover, while explaining why bootleggers break the law, says, “The moral dimension is missing from a criminal’s make up.” It’s an odd moment: Knowing what we know about the paranoid future leader of the FBI, anything Hoover says about morality is suspect. The actor delivering the line, Eric Ladin, serves it up authoritatively and smugly. He makes it sound pat, a hubristically simple explanation for what lurks in the minds of gangsters. It feels like we’re being encouraged to roll our eyes at Hoover, who doesn’t get the depth and complexity of the show’s protagonists, who each break the law for their own reasons, in their own ways. Except that Hoover is exactly right. The moral dimension is missing from nearly all of Boardwalk Empire’s characters, who murder and maim, if somewhat discriminately. This is what passes for morality on Boardwalk: criminals with enough self-control not to kill everyone they lay eyes on. Boardwalk Empire is as good-looking and well-acted as ever, but it still has bullet holes where its head and heart should be. As with last season, the very first sequence contains a gruesome murder, and the bloodshed just continues from there. A man gets his throat slit and another his head bashed in, a father takes a shot to the brain, a racist pervert gets stabbed in the neck so many times his head almost comes off, a woman shows up trampled in a mud pit, a tough is mowed down by machine guns, one man’s brains smear a wall, another’s insides spray a barn, another guy vomits his guts out, and someone else’s head gets macheted. That is not the full body count. Almost everyone who seems like they are about to gruesomely die on Boardwalk Empire gruesomely dies. The surprise and suspense comes not when some ultraviolent deed occurs, but when it doesn’t, which is rare. When we left off last season, the Eastern Seaboard was gripped by a gang war with many casualties. In the first new episode, a lonely Nucky Thompson (Steve Buscemi) puts an end to the war and, with it, the engine of the show’s story. Season 4 starts slowly, jumping from Chicago to Philadelphia to Atlantic City, N.J., to New York to Florida for bouts of unrelated drinking and death. Boardwalk has never been quite this bleak or meandering. Nucky’s former wife, Margaret Schroeder (Kelly Macdonald), is still in the credits, but she’s MIA, having fled with her children at the end of last season. As one of the few characters who was not a cold-blooded murderer, she’s sorely missed, especially since every other nonprofessional killer on the show is engaging in their worst, most depressing behavior. Gretchen Mol’s Gillian Darmody is now a drug addict. Michael Shannon’s George Mueller, formerly the deranged but extremely law-abiding Agent Van Alden, is caught up with the Capone gang. Nucky’s sweet-faced nephew, a freshman at Temple, quickly shows himself to have a gangster’s instinct for self-preservation. Richard (Jack Huston), the man with the mask, is still acting as a hit man when the season begins. After mercilessly killing many people for money, he realizes he’s lost his way when he is unable to put down his childhood dog. A father sobbing for his life does not move Richard, but an old, dying dog does. If this is his moral dimension, I don’t want to know about his immoral one. Boardwalk Empire was created by Terence Winter, who came up as writer on The Sopranos, a lineage that gets more confounding with each season of Boardwalk. The Sopranos’s David Chase was keenly attuned to the foolish, stubborn, soft-hearted, even ethically reprehensible ways that audiences thrill to violence. Viewers may have hoped that Tony Soprano wasn’t quite Tony Soprano, no matter how many horrible things he did. Chase knew better. Winter does not seem to. On Boardwalk, the violence is the thrill. If some of the characters are unhinged sociopaths, they only serve to make the hinged sociopaths gleam by comparison. 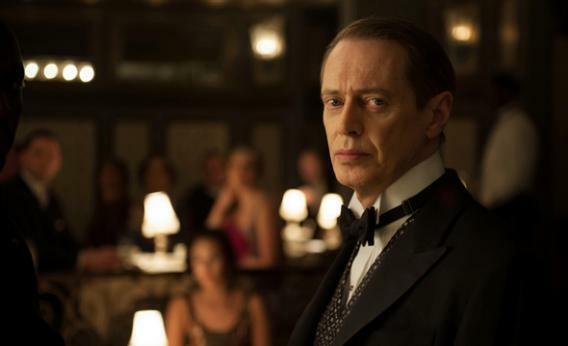 A man like Nucky Thompson, with his impeccable suit and calm, reasonable manner, only murders and manipulates people when it is in his very best interest. He’s a model crime boss. Boardwalk Empire keeps mistaking him for some kind of hero.